Hello! My name is Nick. Hello! My name is Nick. I have been a practical beekeeper for 9 years and a virtual (read armchair) beekeeper for much longer. I have a small apiary in the Rocky Mountains of Northern Colorado, USA. Honeybees and beekeeping have always been major interests in my life. I enjoy helping others to learn about the only insect in the world actively kept by humans…honeybees. I also enjoy building my own beehives, managing my apiary and helping other people keep bees. For me, beekeeping is a way of life. In the past couple of years, I have noticed an increase of interest in bees and beekeeping. I have received phone calls and emails from people who wanted to naturally keep bees on their property, but did not have good resources to get started. After discovering the Warre Hive in the Fall of 2007, I knew that this hive would be perfect for those who wanted to keep a few honeybee colonies simply and in a sustainable manner. So, I decided to create The Bee Space in order to provide a resource for natural and sustainable beekeeping. Please consider donating to one of the following worthy recipients. Thanks! Donate to The Bee Space. Why? If you found this site helpful or insightful you might want to give a little something in return. I love your website and natural beekeeping too. I am gonna make Warre hive. I do not know of width of top bar and spacing. Would Warre’s dimensions work in Toronto? Did you use spacing for Europeans bees? Sid – Thanks for your compliment! You can find the top bar width and spacing in the Warre Hive Plans. The plans are a free download. And yes, I did use the spacing recommended by Warre. This spacing works well for bees here in North America. Yes, the Warre dimension would work in Toronto, if you made the walls a bit thicker. I know of a beekeeper who is using the Warre Hive in Central Alberta, Canada and is having good success with them. Could you elaborate on the “wax starter strips under each top bar (NO FOUNDATION)” Is this adhered or brushed on? The easiest way is to drizzle it on. Take a top bar and let it soak in cold water, this will be your drizzle guide. Take a top bar you wish to get a wax starter on, and then take your wet drizzle guide and place it halfway across so the drizzle line is where you want the wax starter. Then with a teaspoon, drizzle hot beeswax in the groove created by the two top bars together. The beeswax will not stick to the cold wet top bar, and when you immediately pull them apart, you have a wax starter strip for the bees to start on. Do you only make Warre bee hives. Have you ever used a top bar bee hive? What is the advantage of a Warre over the top bar bee hive. Hi Nick. 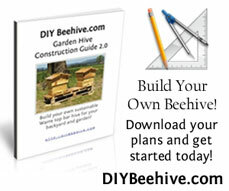 Thanks so much for the site, a fabulous resource for natural beekeepers!! We’re experimenting with Kenya Top Bar Hives and Warres in Italy. We’re in our second year so we are beginners, but I do have some thoughts on the KTBH as compared to the Warre. In our experience the most important difference is the number of interventions required in the KTBH as compared to the Warre. It’s necessary to check the KTBH regularly and often when they are building new comb to make sure they are not cross combing since this makes the bars immobile (which is a huge problem with moveable top bars as compared to fixed bars). Also, frequent harvesting is required to maintain enough empty space for the bees so they’re less prone to swarm. For us this is a big deal because we are in agreement about the importance of minimum interventions in the hive for bee health and tranquility. So this is the main reason why we are moving towards fazing out the KTBH in the future in place of the Warre hives. This much said the KTBH does have its benefits. There is no heavy lifting, so I can work the boxes easily by myself (if the combs are straight….). And most importantly the bees seem to be very happy and healthy in these boxes. The families just appear to be really strong and active. Thank you again for this site and all the fabulous information and plans!